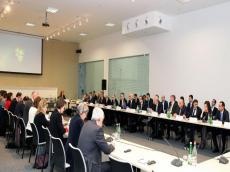 Negotiations on a new bilateral agreement have been held between Azerbaijan and the European Union (EU). The EU delegation at the talks in Baku is headed by the representative of the European Commission for Trade, Petros Sourmelis. Speaking at the meeting with the participation of Azerbaijani and EU officials at the Baku Business Center, Minister of Economy Shahin Mustafayev underlined that Azerbaijan-EU relations are developing, important documents such as Partnership and Cooperation, Visa and Readmission Agreements, Action Plan under the European Neighborhood Policy and the Eastern Partnership Initiative have been signed. It was noted that Azerbaijan and the EU successfully cooperate in various fields, including in the energy sector. Azerbaijan, as the initiator and active participant of such large projects as Baku-Tbilisi-Ceyhan and the Southern Gas Corridor, is a reliable energy partner of the European Union. The main place in the foreign trade turnover of Azerbaijan is occupied by the countries of the European Union. Stressing that Azerbaijan is interested in continually expanding its cooperation with the European Union, Mustafayev recalled that the new agreement was announced by the President of the Republic of Azerbaijan and the President of the European Union in 2017, noting that negotiations on the agreement are being continued, meetings and video conferences are being organized. The minister noted that the new bilateral Agreement between Azerbaijan and the European Union will be important for the development of relations. Deputy Executive Director for Europe and Central Asia of the European Union’s External Relations Service European Union, Luke Devin shared his views on the expansion of relations and the new draft bilateral agreement, stressed that the document would contribute to the development of cooperation between the EU and Azerbaijan. Established in 1991, Azerbaijan-European Union relations are based on the EU-Azerbaijan Partnership and Cooperation Agreement signed in 1996 (entered into force in 1999), which is the legal basis of relations, covering many areas from trade to education. The current negotiated agreement would make it possible to take greater account of the common goals and challenges facing the EU and Azerbaijan today, aiming to substitute the agreement of 1996. Azerbaijan wants an agreement based on political equality with the EU. The EU recognizes the need to choose a differentiated approach to its neighbors. This means that Azerbaijan can benefit from the EU's political association and economic integration offerings at its own discretion. The agreement will cover political, sectoral, trade and economic relations including science and education. Political cooperation will be more crucial. In addition, the economic and energy sectors are also essential. The first meeting to discuss the document took place on April 25, 2017. The new agreement envisages for the approximation of Azerbaijan's legislation and procedures to the most important international and trade norms and standards of the EU, which should lead to improved access of Azerbaijani products to the EU markets. The agreement will comply with the principles approved in 2015 in the document of the European Neighborhood Policy and will offer an updated basis for political dialogue and mutually beneficial cooperation between the EU and Azerbaijan. The energy cooperation between Azerbaijan and EU launched with Memorandum of Understanding that signed in 2006. EU supports the energy projects implemented in South Caucasus and interested in supplying Caspian hydrocarbon resources to Europe, as it comprehends diversification of the energy sources necessary to ensure Europe's energy security. It should be reminded that government representatives from all Eastern Partners including Azerbaijan have been invited to attend the 10th Eastern Partnership Civil Society Forum Annual Assembly that will be held in Tbilisi on 10-12 December. This annual event has been organized every year since 2009, brings together civil society organizations from all six Eastern Partner countries and the EU. The European Union holds the main place in the foreign trade turnover of Azerbaijan. Share of EU countries in Azerbaijan's foreign trade made 42 percent in 2017 and 43.5 percent in the first eight months of 2018. There are more than 1,500 European companies in Azerbaijan. Over the past six years, European countries have invested about $ 16 billion in Azerbaijan's economy.